Concordat Watch - Haiti | Concordats and Vodou: Who controls the Haitian church? 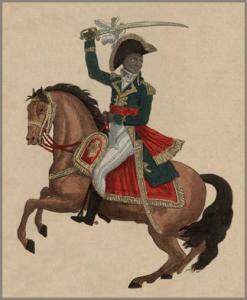 In 1794 the revolutionary French government abolished slavery in the colony of Haiti. When this promise was withdrawn under pressure from the plantation owners it sparked widespread slave uprisings. The black Jacobins found something in the ideology of the French Revolution that helped them to elevate and generalize their struggle. This was the secular ideal of the Rights of Man. It was Toussaint L'Ouverture who managed to put this into practice in Haiti. His surname, which means “[he who finds] the opening [to go forward]”, was given him for good reason. He was the son of a slave born in Africa and he skilfully led an army composed of Black, Mulatto, and White soldiers. Together they successfully fought off invasions by the Spanish, the British and the French under Napoleon. Fearing the “contagion” of human rights, the slaveholding countries surrounding Haiti put the new nation “in quarantine” (“cordon sanitaire”). From 1804 until 1826 no foreign nation recognised Haiti as an independent state. To the world at large she was just a rebellious colony. Despite the fact that Toussaint L'Ouverture had preserved the privileges of the Church — the 1800 Constituion established Roman Catholicism as the sole religion and abolished divorce  — even the Vatican took part in isolating the free black state. When it joined the boycott against Haiti, it withdrew all its priests. After that, for more than half a century, there was no official Roman Catholic presence in the country. This meant that Haiti had to make do with priests who lacked Church training, but knew their Vodou, and sometimes earned their keep by baptising houses, boats and even doorposts. During the Church's long absence when the Vatican did not recognise the country the African-inspired Vodou merged with the remnants of Catholicism. 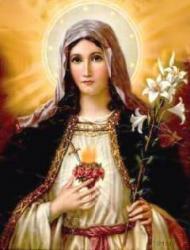 Take, for instance, the pretty lady whose flaming heart is pierced by a dagger. 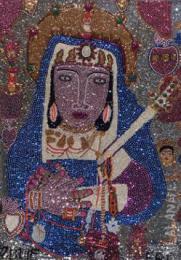 She looked like a passionate soul in a violent situation — and became the Vodou goddess of love. Belatedly, in 1860, the Vatican signed a concordat with Haiti and later that year granted the country diplomatic recognition by sending a papal delegate. This concordat gave the Catholic Church special privileges, (which the Vatican prefered to call “the special protection of the Government”). These included a subsidy for archbishops and bishops “from the public treasury”. It was also agreed that the president nominate the archbishop and the bishops, but the pope could refuse to invest them. Since these clerics were French-speaking Europeans sent by the Vatican to fill these posts, the Haitian president didn’t know them and he had no real choice but to “nominate” them. A couple of years later an amendment to the Concordat (in 1862) granted the Church “an important role in secular education”. This concordat remained in force for more than a century. “Papa Doc” Duvalier dressed in an undertaker’s black top hat and tails, to resemble the Vodou spirit of the dead (but not, of course, in photographs). He controlled the Haitian people through fear — and the Haitian Church through his concordat. To get favourable concordats the Vatican has also used many other dictators, who, like Duvalier, were were mass murderers. Estimates of the number of people Duvalier had killed range from 20,000-60,000 , but this is not what got Duvalier into trouble with the Vatican. By the mid-twentieth century Church leaders had allied themselves firmly with the elite of Haiti who controlled its economy. While the Haitian masses spoke Creole, the mulatto upper classes spoke French, as did the Catholic hierarchy, who tended to be Bretons. The island’s elite and the upper ranks of the Church were also united in their fear of the noiriste (from the French, “black”) upstart, Duvalier, who used Vodou pageantry, not only to terrify his countrymen, but also to pose as a man of the people. In 1959, with his political opponents silenced, Duvalier set about taming the Church. His secret police, the Tonton Macoutes, invaded the Port-au-Prince cathedral during Sunday Mass, beat scores of people senseless, including priests at the altar, then arrested them. Duvalier forcefully Haitianised the Roman Catholic Church. That both Africanized a heretofore European church, and made it pliant to his will. In 1959 he began expelling troublesome foreign priests. 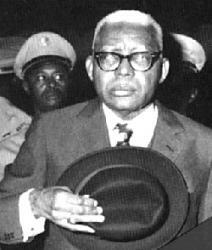 In November 1960, Duvalier expelled Port-au-Prince Archbishop François Poirier. Two months later, he expelled Rémy Augustin, Poirier’s replacement, and the country’s sole native bishop, thereby showing that concern for his personal power trumped noiriste principle. The pope responded by excommunicating him. The concordat was a brilliant tactical move by the Vatican: it gave Duvalier enough control of the Haitian church to dampen his promotion of its Vodou rival. Naturally, it didn’t keep him from carrying out further bloodbaths — but after all, that’s not the purpose of a concordat. From the start Baby Doc was unpopular and soon began to lose his grip on the country. “In a desperate attempt to shore up his sagging image, Jean-Claude struck a deal with the Vatican. In return for giving up the power to name bishops won by his father, he secured a promise of a papal visit. But when the pope arrived for a brief visit in March 1983, he stunned his host with a nationally-broadcast statement in Creole that ‘things must change.’ ”  Following the pope’s cue both a Haitian bishop and an archbishop publicly criticised Duvalier Junior. In addition to a favourable concordat, the Vatican’s belated opposition to the regime offered further opportunities. It allowed the Church to distance itself from the dictator it had once supported. (The Vatican had used the same strategy in the previous decade during the declining days of Franco’s Spain.) This move gave the Church credit for helping to usher out an unpopular dictator and at the same time distracted Haitians from the Vatican’s record of regularly supporting the nation’s strongmen and élites. After a coup d’état removed Aristide, Pope John Paul II dispatched a new nuncio to Haiti to present his credentials to the military-backed government. 9. Dan and Estela Schweissing, “Bishop James Theodore Holly: Afro-American Pioneer Missionary to the World’s First Black Republic, 1861-1911”, Haitian Ministries, 31 December 1999.